Edward Said once famously took the scholar Bernard Lewis to task over the history of the Arabic word for "revolution"—thawra. In an essay called "Islamic Concepts of Revolution," Lewis had traced the term’s usage back to the classical period of the language, and presented evidence showing that it had acquired its current sense only in the 19th century. Before this, Lewis had argued, it would have been more accurately translated by the English terms "excitement," "uprising," or, at the most, "rebellion," having originated in a verb form which literally meant "‘rise up’ (e.g. of a camel)." Rarely has a parenthetical remark provoked such a furious rebuke. Said found Lewis’ discussion to be "full of condescension and bad faith," and accused him of minimizing the political aspirations of 20th century Arabs by implying that their revolutionary hopes were "about as consequential as a camel’s getting up." The accuracy of Lewis’ etymology, which Said did not contest, was beside the point. All that mattered was its motive, which Said took to be thinly veiled racism. This exchange was on my mind as I read the recently published collection of newspaper columns written by Egyptian novelist Alaa Al Aswany for Cairo’s Al Masry Al Youm between 2011 and 2014. The revolutions of the Arab Spring have played out differently in each country in which they occurred, and nowhere have they fulfilled their initial promise. In Syria, the Arab Spring has transformed into an abject tragedy. In Egypt, though, the situation is more of a farce. 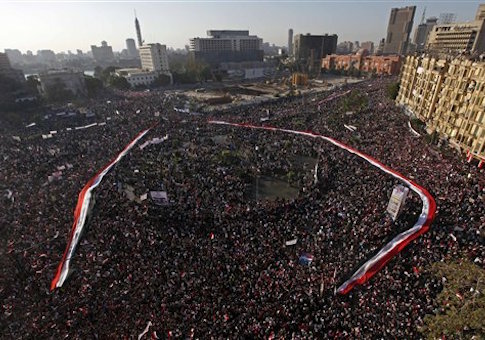 When what Aswany and his fellow liberals—indeed, most Egyptians—call "the revolution" began on January 25, 2011, a military man named Hosni Mubarak presided over a kleptocratic regime composed of equal parts oligarchy and junta and generally friendly to American interests in the region. At the present moment, more than four years later, a military man named Abdel Fattah al-Sisi presides over a kleptocratic regime composed of equal parts oligarchy and junta and generally friendly to American interests in the region. Perhaps the most generous thing one could say about this sort of revolution is that it’s the kind that revolves a full 360 degrees, and quickly. But it is far from clear that even this is the case. During the brief period when it seemed that the old order had fallen decisively out of power—when, from the summer of 2012 to that of 2013, the Muslim Brotherhood and its figurehead Mohamed Morsi were in office—in retrospect it appears that the "deep state," the security forces and network of cronies that have ruled Egypt in some form or another since the days of Nasser, was merely playing the long game. The regime only ever lost the appearance of control, never the thing itself. For those who care about Egypt, reading Aswany’s journalism is a valuable exercise, not only because he is an urbane, engaging, even charming essayist, but also because he is such a representative member of his Western-educated, relatively wealthy class of liberals. Aswany’s dream of an Egypt where the state respects human dignity is their dream; his democratic-socialist politics are their politics; his cynical view of American foreign policy, apparently derived from extensive reading of Noam Chomsky, is certainly characteristic; his frustration with the injustices of the present is certainly their frustration; his toothless growls, pathetic laments, and uncertain hopes are all theirs, too. On 28 January , the Mubarak regime deployed snipers on the roofs of the Ministry of the Interior and all other buildings close to the square. In daylight the snipers put on white handkerchiefs over their heads to ward of the sun’s rays. In the evenings, the laser sights of their guns would circle the square and, when it stopped moving, a bullet would hit one of the demonstrators, blowing their head clean off. The astonishing thing is that, even though the bullets were raining down, the demonstrators did not withdraw or run away; on the contrary, whenever a martyr fell, they would carry them on their shoulders and continue the demonstration. Mubarak was deposed shortly thereafter, and Aswany’s columns provide a running commentary on what followed. At the outset, he is ebullient, even ridiculously so: "Egypt has entered a new era, one where there is no fear, no servility, and no humiliation," he writes in April of 2011. Around this time he still speaks respectfully of the Muslim Brotherhood, insisting that their moderate politics be distinguished from the more radical Salafists. This doesn’t last long: by August he is implying that the members of the Brotherhood might be "fascists," but leaving some wiggle room as to whom he is specifically referring. When the Brotherhood defeats an old guard candidate to win the presidential election, the wiggle room disappears: a 2013 column is titled, "How to Break Free from Fascism," and another, written a week before the uprising that toppled Morsi, is called "Revolt or Die." Aswany’s attitude toward the military undergoes a similar evolution. A major cause of the initial 2011 revolt was public disgust with the police, and especially with the Mukhabarat—the internal state security agency, or secret police. The armed forces, on the other hand, were held in high public regard, and their intervention against Mubarak is praised by Aswany. What was unclear at the time, but which has become obvious since, was that the military’s leadership judged the popular mood and sacrificed Mubarak for its own benefit. Mubarak had always, in a sense, ruled at their pleasure. When the Brotherhood won its upset victory in 2012, the military, rather than confront it directly, allowed it to remain in power until conditions for a showdown were favorable. The Brotherhood, too, ruled at the military’s pleasure. In some states, the people are sovereign. In others, a single dictator rules. In Egypt today, as in many other Arab polities before it, the men with the guns are in charge. By the summer of 2014, as the inevitability of al-Sisi’s rise to power becomes clear, Aswany’s tone is despairing: "Egypt is now going back to square one, as if a revolution had never happened." As if. Shortly thereafter, Aswany was compelled to stop writing his column, or so the collection’s afterword strongly implies. Throughout his foray into journalism, Aswany had concluded each piece with the phrase, "Democracy is the answer," a clever retort to the Brotherhood’s longstanding slogan, "Islam is the answer." But Aswany’s version of the slogan prompts one to wonder: What exactly is the question? Whatever it is, it doesn’t appear to be, "What do the Egyptian people want?" Given two opportunities to select a president at the ballot box, on both occasions the voters selected decisively illiberal candidates, first in the form of the Muslim Brotherhood’s man, and then, when denied that option, in the form of al-Sisi, an unambiguous representative of the old regime. Perversely, for as much as liberals like Aswany hate the old ways, they must also realize that they owe something to the tenacity of Egypt’s deep state, without which the country would have gone the way of Iran after 1979—another revolution that began with crowds of young, hopeful liberals in the streets, before it became clear that the masses had a taste for something a little more old-fashioned. For Egypt’s liberals, who take their political bearings from Europe, all of this has been heartbreaking. And even though al-Sisi commands some popularity today, such unaccountable military rule will eventually break the hearts of the Egyptian people at large, as the country inevitably slides back into new forms of sclerosis and corruption in the years to come. In another book chronicling Egypt’s years of revolution—Walls of Freedom, which focuses on the anarchic street art of the period—there is a striking photograph of a street in downtown Cairo that has been blocked off by the government with a concrete security wall. Its surface has been covered by a strikingly effective trompe l’oeil. From the right point of view, one can stare at the concrete and, instead of seeing only the grim reality of the situation, glimpse a whimsical, painted illusion of a bustling, leafy avenue on which men, women, and children are going about their contented business. So it goes in Egypt. Liberals like Aswany project their dreams of revolution on the reality in front of them. For others, the dream is less of freedom or equality than of simpler aspirations, like security and a job. For yet others, the dream is of a righteous regime obedient to the word of God. What all of them are really looking at are walls. This entry was posted in Culture and tagged Abdel Fattah al-Sisi, Book reviews, Egypt. Bookmark the permalink.